Just received my copy of Don Rash​'s latest Boss Dog Press imprint, Einschlagpapier. 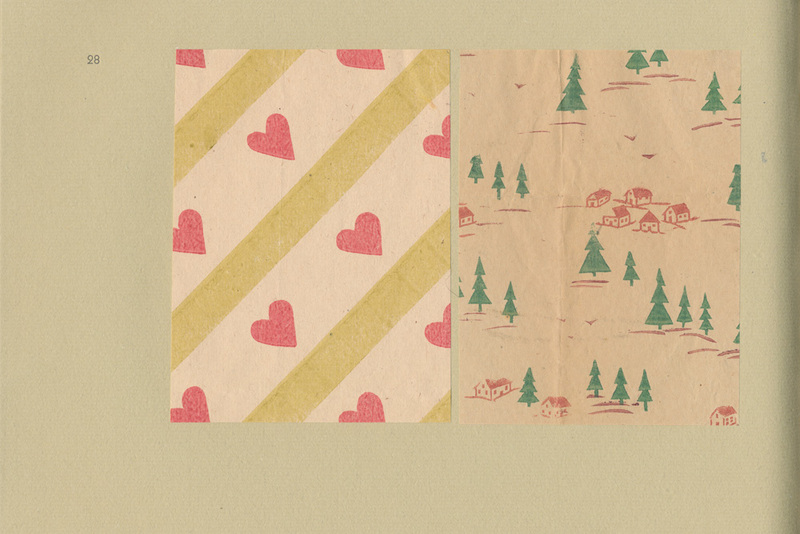 Beautifully done with wonderful samples of these very ephemeral papers. Design-wise, something for everyone. 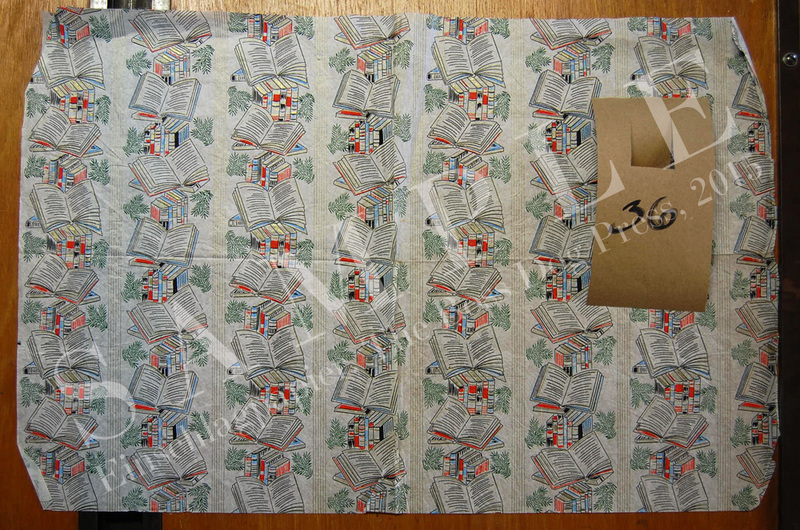 Would be a great addition to institutional collections with graphic and surface pattern design holdings, never mind personal collections... Below the text of the prospectus. The late Dr. James Fraser (and here) was a personal friend and a valued patron of the Boss Dog Press. Quite a few years ago he felt it appropriate that Loyd Haberly's bookbinding equipment be placed in my care. 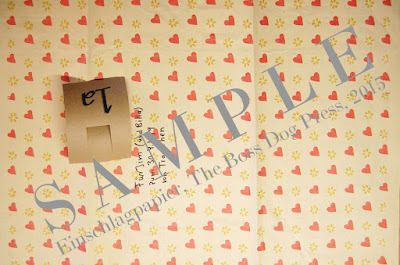 This act of kindness made the 2012 BDP catalog of Dr. Haberly's tools possible. 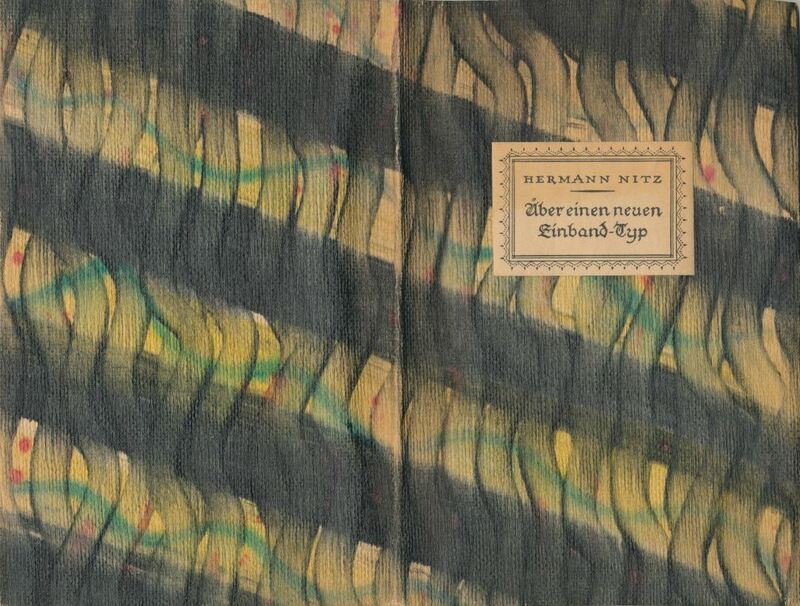 His longstanding interest in East German wrapping papers (arguably one of the more esoteric fields of graphic arts history) resulted in a collection of 63 different wrapping paper patterns, which he acquired both personally and through the efforts of friends over several decades. 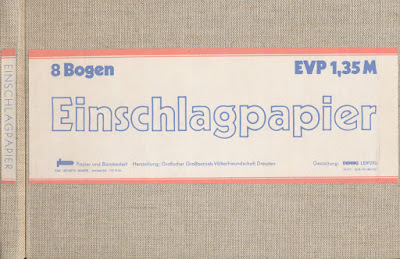 These papers are the core of the forthcoming Boss Dog Press title: Einschlagpapier: Wrapping Papers of the Deutsche Demokratische Republik. The text, written by Dr. Fraser and edited by his wife Sibylle, describes how his interest in these papers developed, and documents his research into their history. 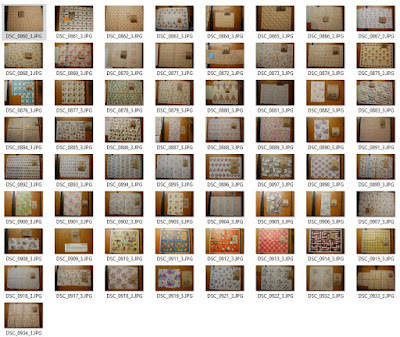 The samples consist of 38 pattern swatches in each book, with sizes ranging from 5" x 7" to 5" x 1 9/16" There are six patterns cited in the text; these samples are situated near their respective citations. 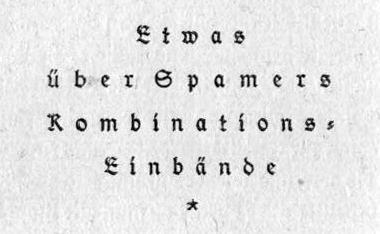 Another pattern is used as a tailpiece to the text. The other 31 swatches are arranged by decade as per Dr. Fraser's original dating. 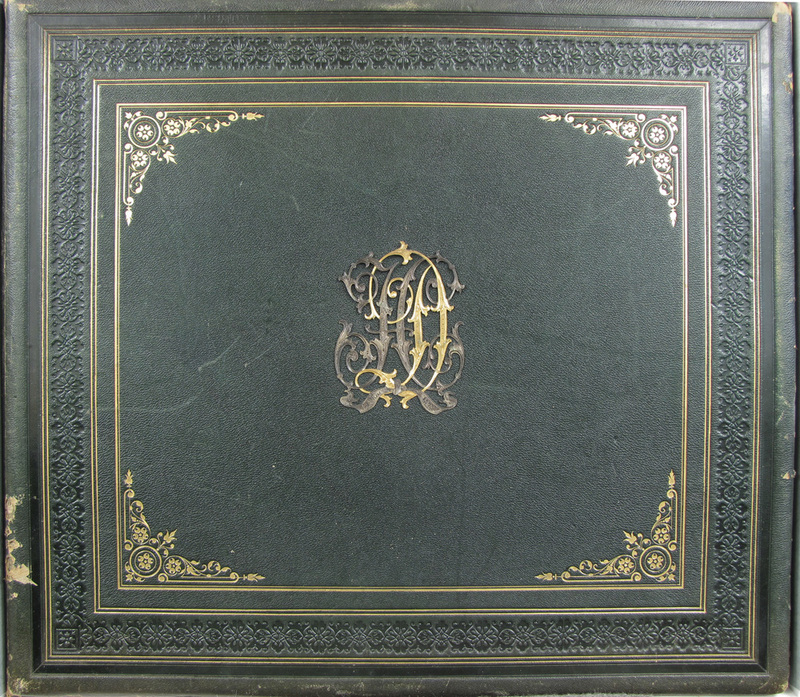 In order to maximize the sizes of the samples per volume, the edition size had to be limited to 20 copies; of these, three are reserved for the Fraser family and one for the Press. 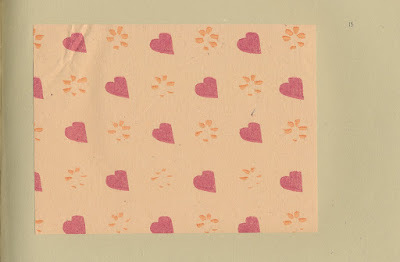 Although the remaining samples were insufficient in area to be used in all of the copies, most were large enough to provide one 5" x 7" swatch. Twenty of these will be used as frontispieces, each unique to its copy of the edition. 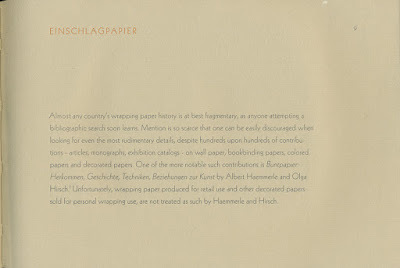 Page size for the edition is 7 1/3" x 11" in landscape format.· The book is imposed in seven quarto signatures with 51 numbered pages plus colophon. The paper for the text and for this prospectus is handmade Old Master Gaspe from La Papeterie Saint-Armand in Montreal, Canada. 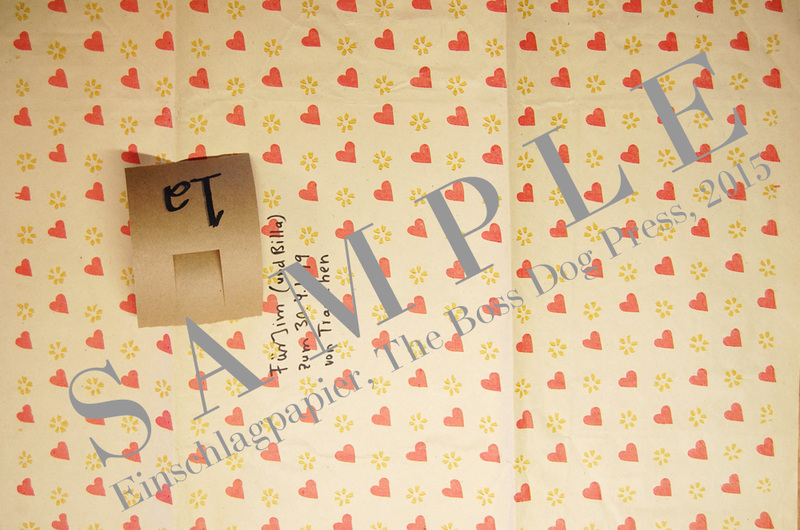 As with prior Boss Dog titles, the paper will be dampened and printed on our Washington handpress. The typeface for Einschlagpapier is Linotype digital Kabel, set in Adobe In Design here at the Press. 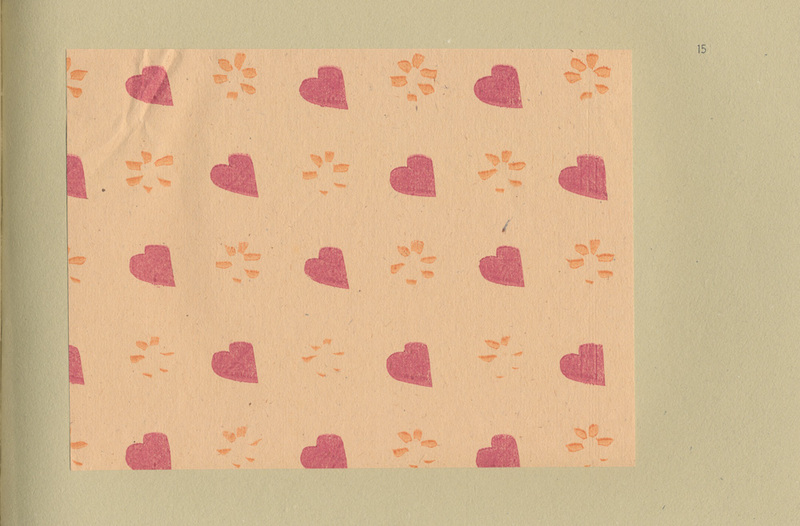 Kabel was designed by Rudolf Koch in 1926; a monoline face with rather eccentric features, it has a marked affinity to the aesthetic of these wrapping papers. 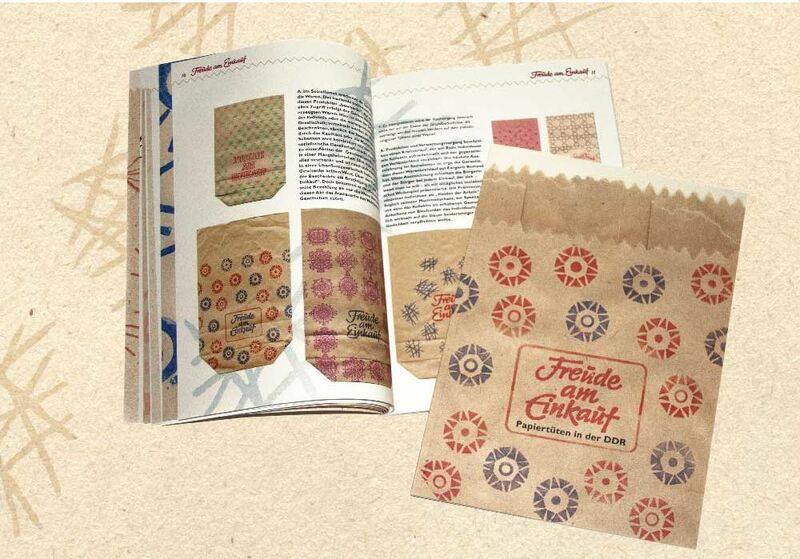 Polymer plates for the project are by Boxcar Press in Syracuse, NY. Bindings will be full Scholco Half-Linen cloth over boards, with paper labels scanned from wrapping bands in the collection. Each book and an accompanying DVD of images of the complete collection of papers will be housed in a matching full cloth clamshell box. 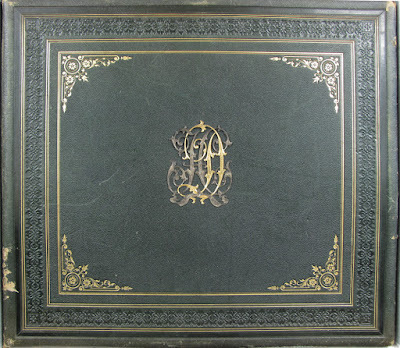 As noted above, the edition size is 20 copies, with 16 for sale. The price per copy is $750, payable by check or credit card. Payment over time can also be arranged. As usual, standing order customers receive 20% discount plus free shipping. Dealer discount is 30%, but given the miniscule size of the edition the Press regretfully has to limit one copy per dealer. The cost of shipping is $15.00. While normally we send along an order card with each prospectus, due to the unique content and very small size of this edition we are asking interested parties to contact the press via email or phone in order to ensure prompt processing of orders. 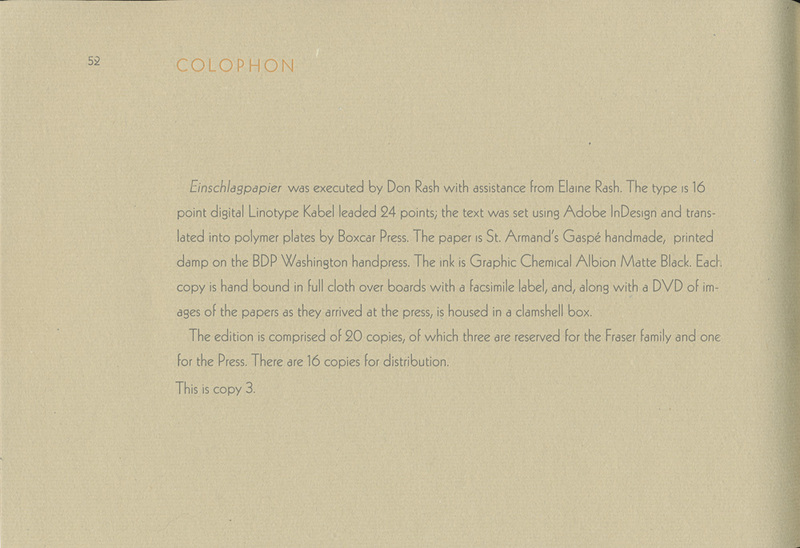 Below scans of the cover and selected pages from the introduction, of illustrations, and the colophon. 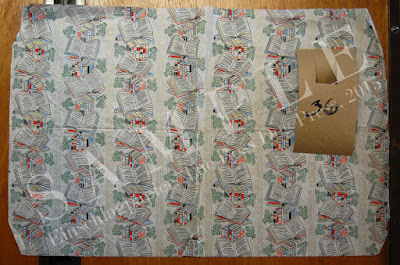 The book also contains a CD of images of the full sheets. 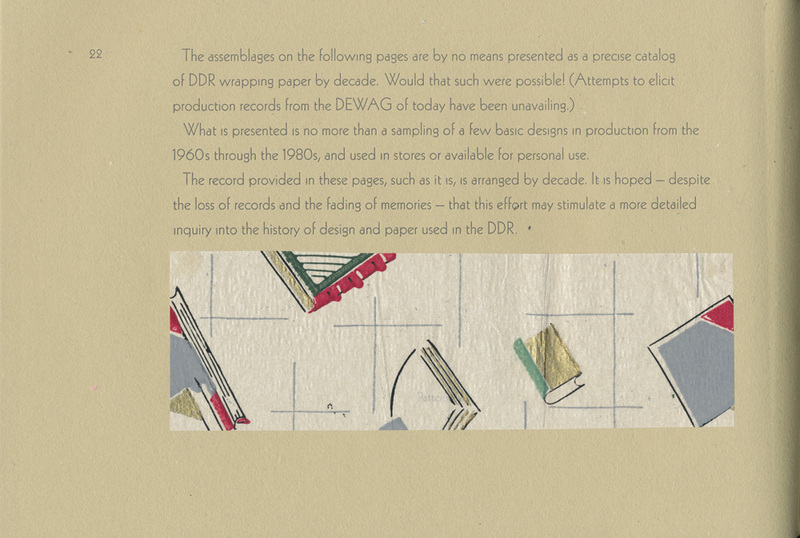 While not at reproduction quality, they give a wonderful overall sense of the surface pattern design of these papers. 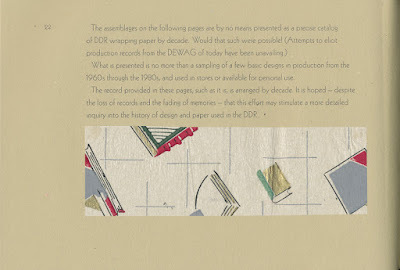 The CD also provides descriptive data for the swatches included in the book, swatches that were produced from these sheets. 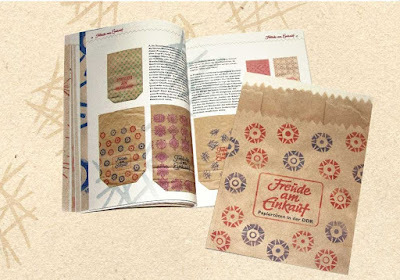 A wonderful complement to Einschlagpapier is Freude am Einkauf – Papiertüten in der DDR, a book that while in German is richly illustrated with images of the paper bags produced for shoppers in the DDR, bags that shared the joy of shopping. 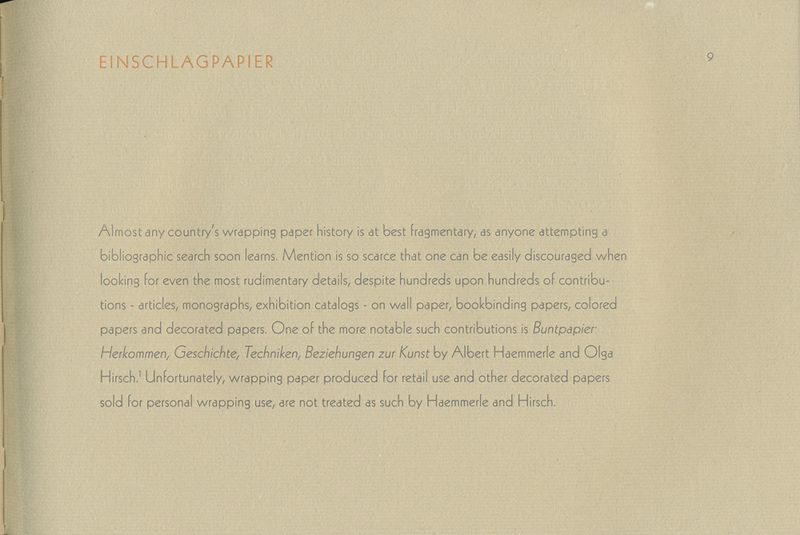 The book can be ordered worldwide from Edition Panorama Berlin. ISBN: 978-3938753545. Both books are wonderful to an collection related to decorated papers, surface pattern design, historical studies. 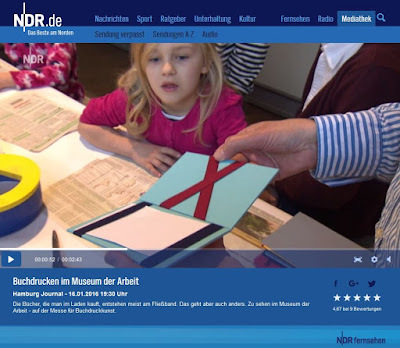 Via the Pirckheimer-Gesellschaft, a Berlin-based bibliophilic society I am a member of, I was made aware of this video of the Buch Druck Kunst fine press fair at the Museum der Arbeit (Museum of Labor) in Hamburg. 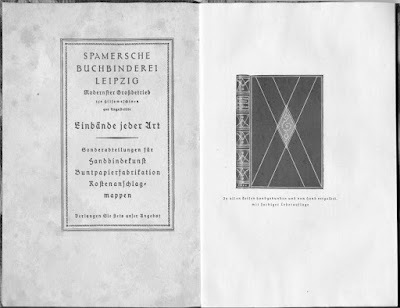 In addition to vendors selling antiquarian books in addition to fine press editions…, they also had hands-on workshops for young and old in making bookish Jacob’s ladder like folders, silk screen printing, and papermaking. This reminded me of visiting the Cologne-based model railway trade show where the large manufacturers also had layouts on the floor, platforms, or tables for kids to play with any way they wanted. Even had kits for the kids to put together with glue, scalpels, snips. Anything for them to be hands on. Still have the house my daughter built at 5 or so on my layout. Wonder how many books fairs have these kinds of activities…? Would be a great way to connect with the next generation on a multitude of levels. 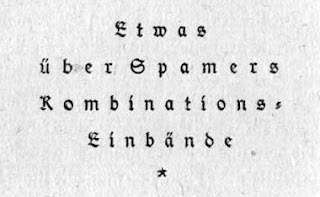 Diese Geschichte der Collins und die folgende Bibliographie der Schriften von Ernst Collin beansprucht nicht vollständig zu sein, vor allem, weil sie aus der Ferne mittels digitalisierten Sammlungen, Fernleihe und angekauften Büchern zusammengestellt wurde. Sie will einen Anfang machen und darüber hinaus einen Einblick in die Welt der Familie Collin geben. Ernst Collins Ansichten und Schriften über Buchbinderei sind unter allen Quellen die wichtigsten. Die Arbeit soll auch dazu dienen, das Vermächtnis und die Leistungen dieser Berliner Familie wieder ins Gedächtnis zu rufen. 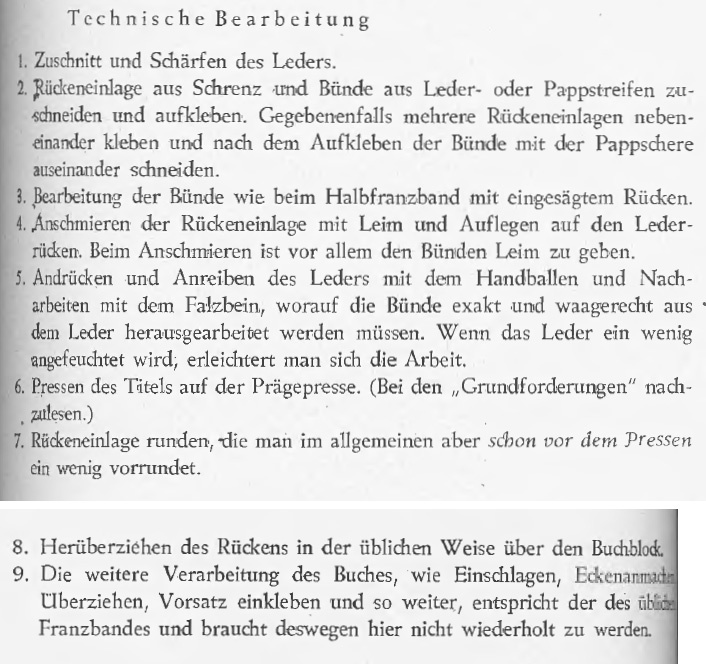 Es folgen in weiteren Teilen Kapitel zum Leben von Ernst Collin, seinen monographischen Schriften, Aufsätze in Zeitschriften, eine Beschreibung der Quellensuche, und ein Verzeichnis seiner einzelnen Schriften. Das Gesamtwerk ist noch im Aufbau und wird Ende 2016 vollendet sein. Mehr hierzu können Sie unter „Colliniana“ wo einige Teile des Inhalts vorab beschrieben wurden.